With the summer sun abandoning us in favour of wintery chilliness, pumpkin-spiced lattes back on the menu and the festive season fast approaching (or at least that's what the shops keep telling me), it seems only appropriate that I'm taking a look at Brain Games' sub zero penguin-powered dexterity game Ice Cool. Because nothing says 'festive' like accidentally firing plastic penguins at your friends! Set in an ice covered frozen school, players take on the roles of class-skipping penguins (the Runners, or 'loveable reprobates') and their hall monitor (the Catcher, or 'teacher's pet'). The school itself is amazing. The clever box-within-a-box design means the relatively slim-line game box unfurls into a huge arena to flick your penguins about in, filled with cute, beautiful artwork. The art inside the box is so sweet! Setup is super-quick; match the coloured spots in each doorway to align the right pieces of box and clip everything together. Everyone gets an adorable little wibbly penguin (weighted at the bottom for maximum flickability - yes, I'm sure that's a word), a penguin ID card and a colour reminder card in case you manage to forget which one is yours. Each round, players take it in turn to play the Catcher. Their job is to tag all the Runners penguins before they can grab their matching coloured fish. Each penguin that gets caught has to hand over their ID card to the Catcher, and if they all get caught the round ends. The Runners are trying to collect up all three of their matching coloured fish before getting hit by the Catcher. The fish hang over door frames throughout the school, and if you're able to flick your penguin through a doorway you can take the fish of your colour from above that door. Once a player manages to collect all three of their fish, the round ends. 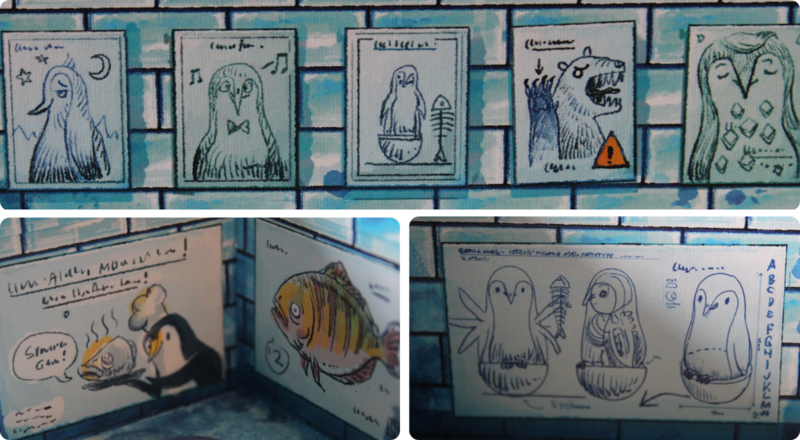 At the end of each round, players are given a victory point card for every ID card they have, whether it's their own or stolen from another penguin. This is great news for a good Catcher and bad news for an unlucky Runner! Everyone gets their card back for the start of a new round, a new Catcher is picked and play continues until everyone has had a turn at playing the Catcher. At the end of the game, the player with the most victory points on their cards wins. Action shot - I eventually gave up trying to catch the impact! My own lack of dexterity aside, this is a great little game that will have people sneaking in practice flicks, deliberating the best angles for the perfect shot and asking for more games straight away. It's silly, funny and with a play time of around 20-30 minutes it fits nicely into any games night. Great for adults and kids alike, if you're starting to think about Christmas this might be a good game to pick up for the family to play over the holidays!